Khloe Kardashian has admitted she has learned a lot about motherhood from her sisters. Khloe Kardashian has learned a lot about motherhood from her sisters. The 33-year-old reality star welcomed her daughter True Thompson - whom she has with her boyfriend Tristan Thompson - into the world last week, and has claimed in a post on her app that she is picking up parenting tips from her sisters Kylie Jenner, Kim Kardashian West, and Kourtney Kardashian, who all have children of their own. The 'Revenge Body' star admits she isn't the best at taking advice from other people, but knows she can always go to her siblings for judgement-free tips. 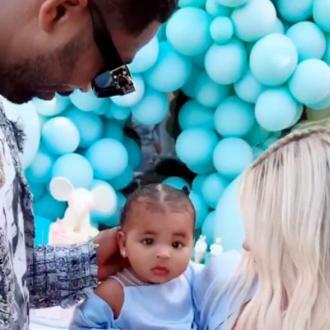 Khloe is currently leaning on her family and 'Keeping Up with the Kardashians' co-stars more than ever, after video footage emerged shortly before her daughter's birth, which seemingly showed her NBA star beau leaning in for a kiss with another woman. Recently, it was claimed Khloe was living alone with her daughter after kicking the 27-year-old basketball player out of their shared Cleveland home.